• Support start-up-capital: To facilitate independence for people with disabilities in the community we check the feasibility of a business via a business plan and if the sponsor agrees we assist them with the required funding to independently own their business. Since 2005, the Center has assisted 25 business shops that provide many different services in the community through the help of many organizations and sponsors in and outside of the country. Examples of these are: massage parlor, mobile phone sales and repair, computer analysis and programing, shoe repair, dress making and tailoring, etc. • Tuition Support for High School, University, Preschool and Primary School: The goal of this program is to provide children with disabilities the funds to obtain a higher education. Currently the NNC assists 29 students in the following fields: Accounting, Computer Science, Business Administration and Electronics. We also want to assist families with disabled members who are poor or have many difficulties to send their children to school, even Kindergarten. 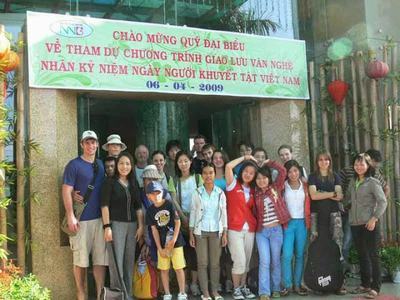 • Support for Apprenticeship Programs in the community: The Nguyen Nga Center with cooperation with local industry supports a community based Apprenticeship Program. The Center provides the funds to send young adults to vocational training sites in the community with a variety of different careers, such as: Masseuse, mobile phone repair, electronics repair, hair stylist and domestic science. • Support for Equipment (machinery, tools etc.) This Program provides additional support for already financed businesses that have been operating for a period of time and may need some additional support to purchase new equipment. • Support mobility for Community access: Accessibility via bicycles, wheelchairs or crutches is prerequisite for activity in the community for people with disabilities. While the Center can`t provide for every mobility deficit, through Grants from Organizations and individuals NNC provides mobility to many disabled. • Support Program for weddings,...: When disabled children grow up, start to socialize, want a partner and get married questions arise about reproductive health, gender and other social issues they must face. The Nguyen Nga Center provides support with counseling and financial assistance for weddings in order to encourage the spiritual life of young adults and their social welfare. • Holiday Events throughout the year: With the help of donors, NNC organizes several events throughout the year when the general community has the opportunity to interact with and learn about disabled people through exchange at social events. Disabled people also have the chance to share life and work experiences with each other. This is a substantial and important encouragement for social interaction and to gain self-confidence regarding their integration into the community. The participation of sponsors at these events is encouraged and coordinated by the staff of the NNC.